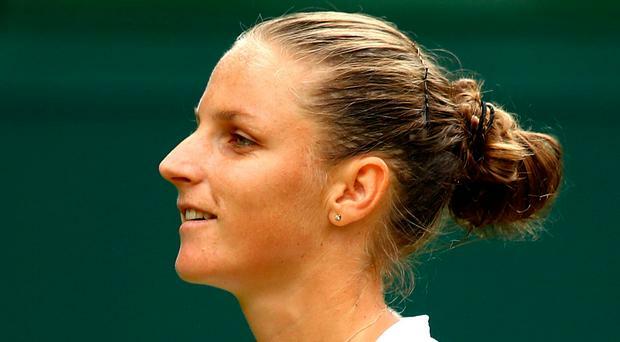 Karolina Pliskova won a Wimbledon battle between former World No.1s against Victoria Azarenka. The Czech seventh seed triumphed 6-3 6-3 in the Centre Court opener and kept alive her hopes of a maiden Grand Slam title. Azarenka, who is ranked 87th in the world, is only just getting back to tour action after a custody dispute involving her son. She was competitive throughout the second-round clash, but Pliskova won out in the big moments. Madison Keys celebrated Independence Day by moving into the third round. The American, seeded 10th, beat Thailand's Luksika Kumkhum 6-4 6-3. Keys was pleased to mark July 4 but was struggling to find other ways to enjoy the day. "I won so that's a good start, I'm happy," she said. "I don't know how I will celebrate - maybe a barbecue. London doesn't really care about July 4. There's not much going on." Croatian Donna Vekic followed up her toppling of fourth seed Sloane Stephens with a 7-5 6-4 win over Rebecca Peterson. Evgeniya Rodina will meet Keys next after a 6-1 2-6 6-3 success against Sorana Cirstea, while Yanina Wickmayer beat Andrea Petkovic 6-4 6-3.